Customer feedback is a gift. I believe that. I wrote a whole book about it called Hug Your Haters. 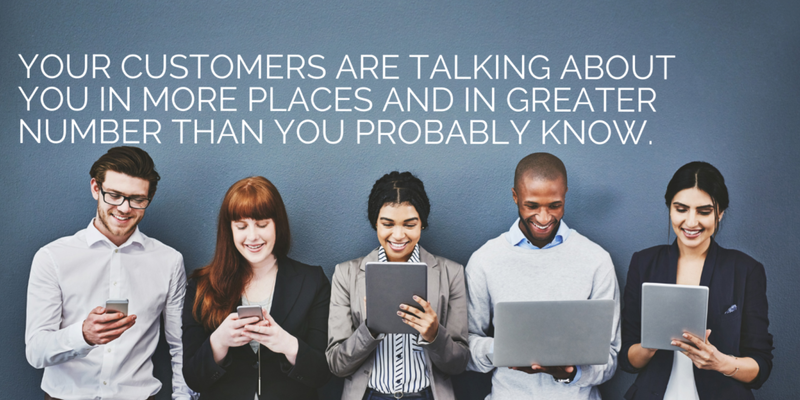 Indeed, customers are doing you an enormous favor by taking the time to alert you to a problem when it occurs, or to their happiness, when that’s the outcome. The value of feedback is heightened today, as customer experience sways purchase decisions more than ever. Thus, listening to and analyzing customer feedback is crucial to make sure the company meets or exceeds ever-escalating expectations. But making customer experience changes based on customer feedback isn’t always wise, as you’ll see in this article. An anecdote is just a story. And too often we use stories, which began as customer feedback, to shape our company operations. This is dangerous. But it happens all the time. How does this occur? How do we end up in a place where listening to customer feedback may actually be harmful? As discussed in Hug Your Haters, your customers are talking about you in more places and in greater number than you probably know. For instance, the overwhelming majority of tweets about a business do NOT tag the business in question. Also, there is a lot of chatter about companies in discussion boards and forums, where many businesses do not actively listen. The result of not listening hard enough is that the volume of customer feedback is diminished. Consequently, when you haven’t collected all that much feedback from customers, the feedback you DO get is magnified in its importance. In this scenario, it’s easier to spin specific pieces of feedback into anecdotes: stories that you can use to shape the customer experience narrative how you prefer. We remember really angry customers. And we remember customers who are incredibly happy and satisfied. This is human nature: we discuss different and ignore average. But, when you’re looking at your customer feedback and trying to decide what it all means, it’s disproportionately easy to remember the five stars and the one stars, turning that sliver of the whole into anecdotes and calling them data. Why is this a problem? What’s the downside of using just a few customer viewpoints to help shape how and why you do things in your company? Because truth requires math. An anecdote — even a great and powerful one — is just a blip. 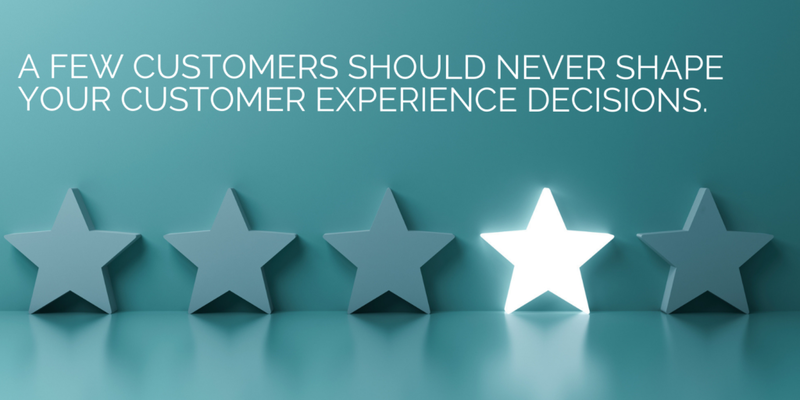 One (or even a handful) of customers should never shape your customer experience decisions, regardless of how persuasive, powerful, or poignant their feedback. The opinions of one customer, in one circumstance, in one moment in time, based on their specific experience is just that: ONE experience. And that can create feedback that is VASTLY different and dangerously contradictory. I learned this lesson quite clearly over the past 30 days. My newest book is called Talk Triggers: The Complete Guide to Creating Customers with Word of Mouth. 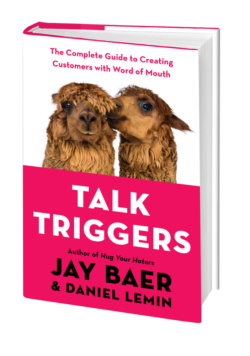 Written with Daniel Lemin, Talk Triggers is comprehensively researched and includes the 4-5-6 system for creating word of mouth strategies that acquire customers (4 Requirements of a Talk Trigger; 5 Types of Talk Triggers; 6-step Process for creating Talk Triggers). Because the book is about word of mouth, Daniel and I decided the book should have a feature that stands out; something to create conversation among readers. If you buy this book and do not love it, go to TalkTriggers.com and send the authors a note. They will buy you ANY other book of your choosing. So far, out of MANY thousands of readers, we’ve had just two redemptions of this very special guarantee. And they taught me just how dangerous anecdotal customer feedback can be. The number of examples were few compared with the number of companies in the country. Fair enough, Gary. Although it would be a long book indeed if we aimed to write case studies about all the companies in the country. Too many case studies. The book relied on them way too much. James, meet Gary. Gary, meet James. You guys should get along great. And that’s why anecdotal customer feedback can be dangerous. Same book. Exactly opposite feedback. Make your customer experience decisions based on math, not stories. 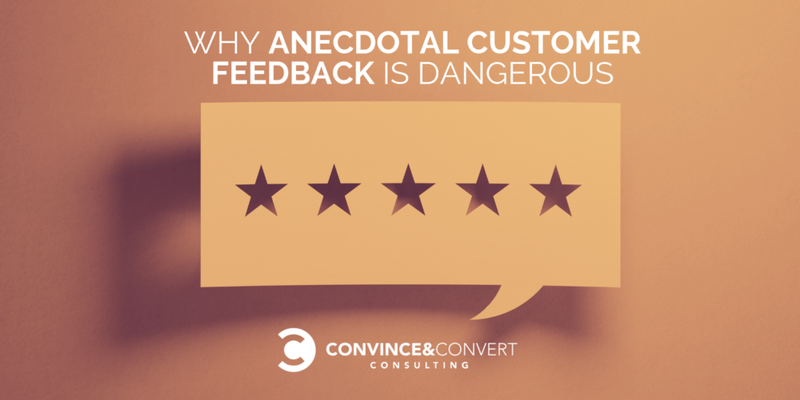 The post Why Anecdotal Customer Feedback is Dangerous appeared first on Convince and Convert: Social Media Consulting and Content Marketing Consulting.